Newman (population 956) is located in eastern Illinois in northeastern Douglas County. Newman is about 25 miles southeast (as the crow flies) of Urbana on U.S. Route 36. The Brushy Fork River runs through Newman as does a line of the Baltimore & Ohio Railroad. 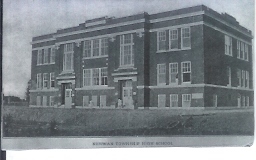 Newman High School existed through the 1993-94 school year. 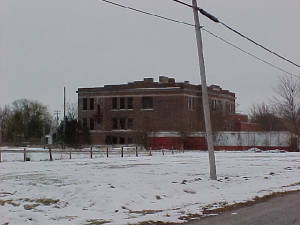 The Newman school system was annexed to the Hume-Shiloh School District (6 miles to the east) in 1994. 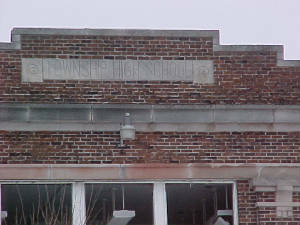 The Newman High School building stood on the north side of town, a reminder of the town's historic past for several years. 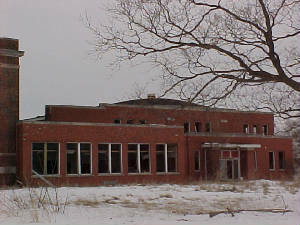 After sitting idle since its closing, the school began to fall into a state of disrepair. It was decided the cost of fixing the structure was not feasible. 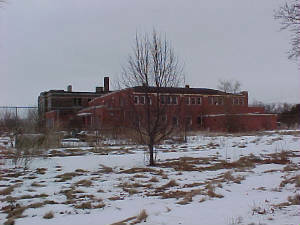 In November and December of 2006 the once grand Newman High School building was demolished. Let us hope the memories of this school live on for eternity. School Fight Song: "Newman Loyalty"
We're loyal to you, Newman High. For we know you have sand, Newman High! Victory from you Newman High! 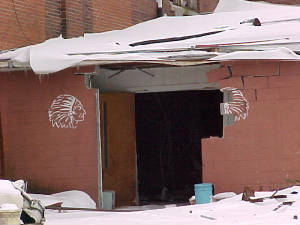 Newman High School's Redskins had many successful seasons in several sports over the years. As stated above, the most extensive listing for the school is under the sport of football. Records are available for NHS from 1913 through 1992 in football. There were also titles won in the sports of boys track, girls track, baseball and boys basketball. 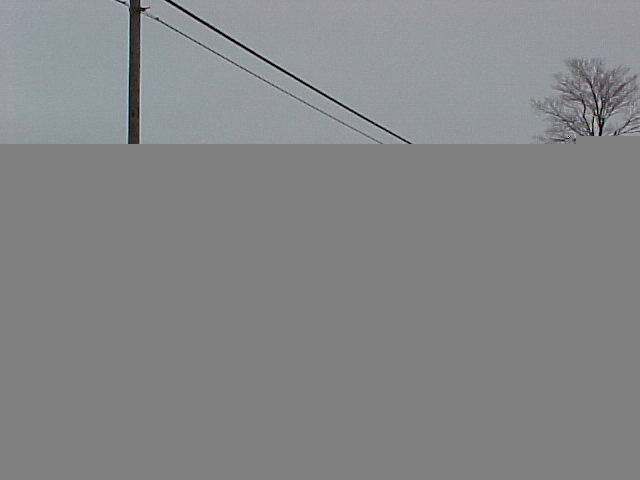 It is believed the school offered girls basketball and is a fact the girls competed in volleyball. The Redskins were known for their competitive nature. Their best seasons are listed below. The Newman High School Redskins had some real nice boys basketball success during their existence. Sadly the records of the IHSA title winners are not listed. The best season as far as post season success occurred in the 1955-56 season. That year the Redskins won both their District and Regional to reach the round of the final 64! The team's record and coach's name are not available. The 'Skins did have two great seasons toward the end of their time in 1989 and 1990. These two seasons saw back to back victory totals of 22 wins. We are very interested in the records of the other teams listed and even of those that might not be listed. If you have this information please forward it to us via e-mail. Several scores from basketball involving the Newman Redskins were located on a website titled "Illinois Postseason Basketball Scores." These scores are listed below as well. Atwood won District, finished 2nd in IHSA Tourney! RANTOUL (67): Lathrop 23, Moran 14, Zachary 12, Taylor 9, McGreal 9. NEWMAN (65): Edmondson 23, Kincaid 12, Morrow 10, Sollers 8, Welliver 7, Stutz 5. 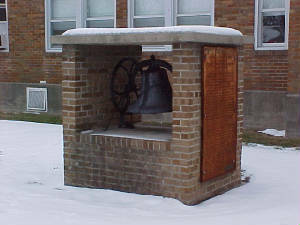 As stated above, the Newman High School Redskins have a very extensive record of their football seasons dating back to 1913 on the IHSA web site. The Redskins made the IHSA Class 1A playoffs on three occasions. The team of 1975-76 made it to the second round (Elite 8!) of the playoffs. The best of the Newman HS football seasons are listed below. The boys baseball team of Newman High also won some IHSA hardware. Three consecutive seasons had some definitive success for the Redskin hardballers. The seasons of 1987 - 89 brought home winning records and, most importantly, two Regional titles. These seasons are listed below. Four Newman Redskin boys brought home a total of 6 medals from the State Track Meet. In addition the boys team of 1938-39 won the District Meet for their area. The excellent accomplishments are listed below. The Newman Lady Redskins also also had great success on the oval track. In fact, the Lady Redskins of 1987-88 finished 8th in the Class A State Track Meet. This was accomplished behind Tiffany Fry's State Championship performance in the Shot Put and Shelly Minnott's State Championship in the High Jump. Tiffinay Fry actually accomplished a rare feat in Illinois track & field history. Tiffany medaled in her event, the Shot Put, all four years of high school!! The medal-winning performances of the Newman Lady Tracksters are listed below. 1987-88 Team Finished 8th Overall at the State Meet!! Tiffany Fry Shot Put State Champion! Shelly Minnott High Jump State Champion! Volleyball is the only other sport listed on the IHSA web site for the Lady Redskins. Only three seasons are listed with no mention of winning IHSA hardware. The best of the three seasons is listed below. "We had our very own Chief Redskin perform at halftime of varsity games, much like Chief Illiniwek performs at the Illini games. Steve Underwood portrayed Chief Redskin during most of the '80s. We had a blast when our basketball team won those 22 games in '89; that is one of my best HS memories. We beat arch rival Chrisman to win the conference championship and everyone in the gym started chanting EOC EOC (East Okaw Conference.) I am a second generation Newman Grad, my mom was class of '64. Thanks for the great website and trip down memory lane!" "My mother, Marcella Harris, taught & served the Newman school system beginning in 1938 thru 2000. Initially, she was hired as the music teacher at both the grade school, as well as the high school. She taught the vocal as well as the instrumental music and led the marching band during football season. Because she went to NHS as a 21 year old first year teacher, by the time she retired, she'd taught 2 & 3 generations of students from the same family. In 1943, she married the Walnut Point country school teacher & a year later, moved to Sidell & taught music at Metcalf High School until 1950. At that time, she took a hiatus from full-time teaching & became a full-time wife & mother until the 1960 school year, when she returned as the high school math teacher at NHS. As a junior class sponsor, she spent every fall Friday night at the concession stand, which was completely remodled under her direction in the mid 1960's. During the 40's, 50's & 60's, Newman citizens LIVED for Redskins football. Celana & Marta Morrow were the "Chief Redskin" (pattered After the fabled & well-documented "Chief Illiwek" at the U of I), throughout their years at NHS. I am unsure who immediately followed Marta but in the mid-60's, Anna & Paula House, another pair of sisters, began their tenure as Chief Redskin. Linda Catron became the Chief Redskin & served thru her graduation in 1969."